Northline Raceway was originally designed as a 4 car track with 2 separate ways to go around it. By taking advantage of it’s lane change feature, it now runs 8 cars on AC2Car electronics. Our success has led to developing the AC2Car system of racing for others to copy. The unique lane change feature on Northline’s model of the Hairpin turn at Long Beach, allows cars in lanes 1,2 and 3 to choose to continue racing on the outer slot cut for each lane. Or, push a button and a solenoid driven switch guides the car into an inside slot also cut for that lane. Note in the pictures that Lane 4 was designed to be simpler for youngsters to run. It bisects the center of the track with no lane changing feature. I would not suggest that today, since the lane changing proved to be easier than anticipated. Once a car leaves the Hairpin, the track makes a 90 degree left at our reproduction of Turn 7 at Riverside. From there cars climb up a large 180 degree constant radii turn, just as road racers did on the Carousel at Bridgehampton. After negotiating a tight left hander, the cars climb steeply up a hill to level off at the top around Shell Corner. At this height, 20” above the pit area, the cars turn hard right and then quick left down our model of the famous Cork Screw Turn at Laguna Seca Raceway. The cars shoot down for 10 feet then under an overpass where the pit entrance is. Cars that do not choose to enter the pits climb up hill a bit to turn right on to the main straight. After crossing the start/finish line half way over the 11 foot straight, they enter turn #1 which is a 90 degree right hander. At this point Northline Raceway’s slots begin to separate allowing more cars room to pass. I would not build it this way again since spreading the slots has been found to causes many drivers to “boldly” attempt passes where they actually should not. This causes delays in racing until drivers learn the course better. If I had to do it over, I would keep the 3 lanes grouped together separately on either side of the track. This is what we recommend today on our Track building page After turn #1, turns #2 thru #6 represent the S turns at Suzuka. The cars shoot through the long “Detroit Gran-Prix” tunnel exiting up hill out into a left hand, decreasing radii turn. The Nurburgring’s Dunlop Corner. A hard right takes cars onto a 14 foot long banked curve, recreating Daytona’s steep banking. After racing across the banking, sometimes 4 abreast, cars jockey for position as they slow for the turn above the overpass. Here the cars must queue up single file because they are funneled together to once again enter the Hairpin. Once more a decision is made by each driver to decide whether to do nothing and remain on the outside of the track, or hold the lane change button down as his car crosses the switching area at the hairpin, to run his next lap on the inside of the roadway. Legends International Raceway was conceived after a year of trying to snap together sections of digital plastic track, in a failed attempt to imitate my favorite turns at actual race courses. After experiencing AC2Car racing at Northline Raceway, and realizing that a narrow AC2Car wood track would allow me the ability to recreate any stretch of track imaginable, I began sketching a layout containing my favorites turns. Ten months later, Legends IR is nearly ready to see it’s first lap. The heart of my Legends track is our recreation of the Ford Chicane at Lemans. As six cars file through this chicane, nose to tail to prevent side swiping, drivers can hold a button down to guide their cars to their inside way around the circuit, or do nothing and their cars will lap the track in their outside slot. All 169’ of Legends’ 3 outside slots has a different feel than doing another 169’ lap using the 3 inside slots. That’s 338’ of different racing every two laps. No 5 second a lap, rhythm racing, here! 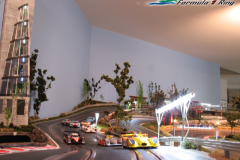 Legends is all about driving scale model cars on a realistic race course. After cars sweep across the lane change area, they race down a 14’ straight. This recreation of the main straight at Lemans includes 6 working individual scale pit areas for cars to turn into. Plus, we have the option to begin a race using the famous Lemans style start. A paddock road runs behind the pits from the Ford Chicane to Turn #1 for a future R/C controlled pace car to exit and enter when needed. Turn #1 curves right leading to an underpass through the hill who’s slopes define the roadway for the Targa Curves. This 5 turn switch back imitates the tight climbing turns through the rough hillsides of the great Sicilian race. Once at the top, 28” above the pit area, cars hump over the crest of the hill under the famous Dunlop Bridge at Lemans. The steep run down Dunlop Hill ends 12 feet later into the Lemans’ Dunlop Esses. This Left, Right, Left combination comes before a 10 foot straight that leads to a long sweeping left hand curve that includes Dave’s Dip. Every turn on Legends is banked. Some are banked slightly to keep cars more in control and others more drastically to add interest. Besides this banking, the Dip is another interest adding feature in the long sweeping Left hander. This sweeping curve brings cars around 360 degrees and culminates at the famous Loews Hairpin Turn. As a 1/32 scale recreation of the hairpin at Monaco, this section will be detailed to include the prototypes stone work walls, which will flow down to the Monaco Gran-Prix Tunnel running beneath it. After slowing for this hairpin, cars run down and turn Right, running down hill through a series of turns through what I call Thunder Valley. Not unlike it’s name sake at Lime Rock, cars here tuck up tight to the rear of slower cars blocking them. This allows a better chance to pass once the track widens past the up coming Monaco Tunnel. This short open arched tunnel, runs up hill to keep cars slotted through this stretch with limited visibility. Once the cars shoot out of the tunnel and negotiate a hard right turn, they fan out into wider lane spacing as they scream across the famous Monza Banked Curve. This tight turn before the banking allows cars on the outer set of slots to hit the high banked curve at greater speed. This was designed in to offset the fact that the inside lanes have a shorter run through the huge 18 foot long banking. Even 1/24 scale cars can go 4 abreast over our recreation of Monza’s once famous banked curves. As cars slow near the end of this fast run, they fight for position to set up for the Ford Chicane that follows. Here, once again, drivers can decide which side of the track they want to run their next lap on. Do nothing, and the car takes the outside. Hold down the button, and lap the inside 169 feet. Each lap is a race within a race, just like real racing. On Legends International Raceway, drivers get to strategize their next pass at every lap. Each driver uses his skills to work his way through the field, take the lead, and hold it. White Lake Formula One Ring was dreamt up the night after racing at Dave's Legends Raceway in December 2007. I was instantly hooked. I have been an avid Formula One fan for twenty some years, so it was natural that I wanted a modern F1 track look and feel. AC2car provided me the opportunity to conceive real racing lines where cars clip the apexes at corners, provide special passing opportunities at various points on the track and lane changing at the pit straight end. The most notable corner at WLF1 Ring is Eau Rouge from Spa Francorchamps in Belgium. I plotted the track in the computer which was thrilling because I was able to see and plan specific passing areas before cutting a single piece of wood. After plotting the track in the computer I had the MDF track pieces CNC milled (computer controlled router). Once those were received it was about 3-4 weeks until I ran the first laps. Now April, 2008 all four lanes are running in true AC2car mode. WLF1 Ring sports 4 lanes each 140 feet in length, so with AC2 car capability each driver can experience 280 feet of unique racing lines. The circuit is smooth and fast with some excellent hairpin corners, quick esses and a twenty foot straightaway across a custom cable stay type bridge. The main straight is flanked by the pitlane, where drivers can use lane changers to enter as well as additional lane changers for an actual pit stop. Entering the first corner at the end of the Main Straight drivers are posed with a lane change option to attempt a pass very much like modern F1 circuits. From there drivers climb up hill and twist through the medium speed Schumacher Esses and then arrive on a short eight foot long straightaway with passing opportunities. Then its hard braking for the sharp left hand Spoon Curve, easily the tightest corner on the track. Coming out of Spoon drivers can accelerate quickly downhill through the fast Senna Esses, past the first Sector Line, then hard braking for the right handed 190R turn. Next smooth throttle control is essential through the left handed Parabolica and then gradual acceleration through the Apex Quad corner, a unique corner with four apexes as the name suggests. Now a quick blast uphill to the AJH turn before the Bridge Straight. There drivers enter an all out drag race on either side of the bridge's spire for twenty feet of speed. Then its a medium speed two apex left hand corner called Bridge after which drivers pass the second sector split time. Lanes open up again after this for some more passing opportunities as the drivers race toward the heart of the WLF1 Ring, Eau Rouge! Eau Rouge is about 35 feet of fast downhill left hitting bottom in a right-hander then climbing back uphill and to the left to the Benetton 90 corner. Eau Rouge is nearly a flat out section and all but the bravest of drivers will blip the throttle to stay on track. Drivers then descend on James Boys J shaped corner as the Normal and Passing lanes converge upon each other before the final Porsche Kurve and then back onto the main straight. AC2car has provided me with a genuine thrill of racing with the challenges of not being able to pass all the time. It's a much more realistic feel then even spaced lane racing could ever provide. Thanks Dave and Jimmy for turning on an (Ex) Remote Control Car guy to the thrills of slot car racing AC2 style!